Welcome to the World of Pyrathia! Shattered Kingdoms (SK) is a text-based sword and sorcery fantasy role playing game, played online by many people at the same time who each assume the identity of a different character. It is free to join and free to play any time you wish! You can log in to the Shattered Kingdoms realm from anywhere on the Internet. SK draws inspiration from table-top games such as Dungeons and Dragons. However, ours is a dynamic world that you can share with many other players around the clock. Like a good book, SK frees your imagination to picture its world and denizens however you see fit. Unlike commercial MMPORGs such as EverQuest, Shattered Kingdoms has players, not ‘customers’. It has the freedom to maintain its unique atmosphere by catering to only certain types of players. Our players are readers and gamers – those compelled by adventure, role play and being a part of an ongoing saga story line. 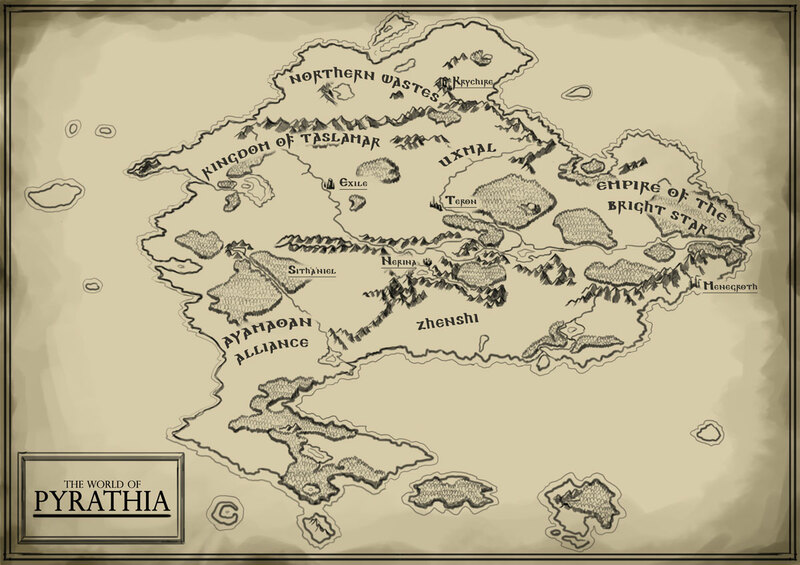 The world of Pyrathia is filled with turmoil and conflict. The political and physical landscapes can change over time. Some of these changes are the direct efforts of players through their mortal characters. Other changes are beyond their control as the gods and other powerful forces have real influence on the realm.